TIME ZONES ARE industrial humanity’s way of dealing with the phenomenon of the sun illuminating a round, rotating Earth. While a person in CHICAGO, ILLINOIS, observes high noon, a person in LONDON, England, is observing sunset, a person in Honolulu, HAWAII, is observing sunrise, and a person in MUMBAI, INDIA, is using artificial light to illuminate the night. So long as travel and communications were relatively slow and timekeeping devices were primitive and inaccurate, this phenomenon remained of purely academic interest. The first practical use of the difference between observed solar times in various areas was in open-ocean navigation. The determination of longitude (one’s location east or west) was one of the great problems of the Age of Exploration. After John Harrison’s 1735 invention of the chronometer, a very precise clock that kept time with only a minimum of gain or loss, navigation officers could determine longitude by measuring the difference between observed solar time and the reference time on the chronometer. Although the use of sextant and chronometer to determine longitude became a critical skill for naval officers, it had little or no effect on the mass of society. All that changed in the 19th century, when the telegraph and the railroad enabled messages and people to outrace observed solar movement. Even a few minutes’ difference between the local solar times of origin and destination could throw schedules into a shambles. Some early English railways tried to coordinate their schedules by the use of an “official watch,” which was carried aboard the train as a reference point. However, such solutions were only stopgaps, and the official time of the Greenwich Naval Observatory began to be transmitted throughout England by telegraph. Other European nations soon followed suit, using the solar time of their capital or national observatory as the nation’s official time. However, such a solution would not be practical for such a vast nation as the UNITED STATES. Under such a system, San Francisco’s observed time would lag three hours behind official time from Washington D.C., leaving Bay Area residents rising in darkness and going to bed when several hours of daylight remained. As a result, American railroads proposed a system of multiple time zones, so that each region’s standard time would remain reasonably close to observed solar time. However, while each railroad company established a common time along its routes to simplify schedules, this “railroad time” was not coordinated across the various railroad companies. Some major stations had to keep as many as 100 clocks in order to track the railroad time observed by all the companies whose trains used them. In 1882, the heads of the various railroads met in St. Louis and worked out a system by which they divided the United States into four standard time zones. Each zone would be centered on a meridian of longitude 15 degrees apart—15 degrees multiplied by 24 hour-wide zones producing the full 360 degree circle of the Earth. This system went into effect the following year, although there were years of resistance before the system of standard time was accepted in all aspects of American society rather than being used merely as a system to rationalize train schedules. In one town, a man was fined for contempt of court when he failed to appear for a noon court date, because he persisted in using local solar time instead of standard time. During 1917, at the Anglo-French Conference on Time-Keeping at Sea, it was recommended that all ships, both military and civilian, should adopt hourly standard time zones on the high seas. Whenever a ship was within the territorial waters of any nation it would use that nation’s standard time. The captain was permitted to change his ship’s clocks at a time of his choice following his ship’s entry into another time zone—he often chose midnight. Standard time was not given the force of law until 1918, at which time the Interstate Commerce Commission firmly established the boundaries of time zones within the United States. In 1884, Congress passed a resolution authorizing President Chester A. Arthur to call an International Meridian Conference. This conference was held in Washington, D.C. and established standard time zones for all the world. Although the meeting was being held in America, the Greenwich meridian was chosen as the zero point for the time system, following the established practice in the English-speaking world of using that meridian as the zero meridian of longitude. This time zone was termed Greenwich Mean Time (GMT) or universal time. The conference then established 12 time zones on either side of the prime meridian, as well as the INTERNATIONAL DATE LINE in the PACIFIC OCEAN, at which point each day is considered to begin. 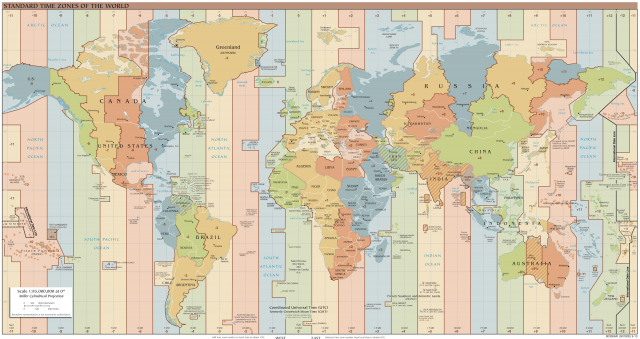 In actual practice, the system of time zones has become an odd patchwork, as various polities have pushed and pulled the boundaries of the time zones away from the ideal arrangement in order to avoid having communities cut in half. This patchwork has been further complicated by differences in the practice of observing daylight saving time in the summer, moving clocks an hour forward to better use the longer hours of daylight. Daylight saving time has often been traced to a satirical proposal by Benjamin Franklin, who in fact was humorously urging his countrymen to rise earlier in the morning. The first practical daylight-saving proposal was put forth in 1907 by William Willett, but his considerable lobbying was unable to convince the British government to adopt it. Only during the fuel shortages of World War I was daylight saving time put into effect by several of the combatant nations, but it was so unpopular that all governments dropped it after the armistice. The United States reinstated mandatory daylight saving time during World War II, but after the peace it left the decision to retain daylight saving time up to the individual states, except during the 1973 Arab oil embargo, when the federal government temporarily mandated an early beginning to daylight saving time for 1974 and 1975. Several U.S. states do not observe daylight saving time at all. It has been an ongoing controversy in INDIANA, which straddles the actual boundary between the Eastern and Central time zones but in fact has adopted a unified time. Although the state has been considerably pressured to adopt daylight time, and a few counties adjacent to Chicago and Louisville follow the daylight-time observance of those respective cities, the main part of Indiana has steadfastly refused to adopt daylight saving time. ARIZONA also does not observe daylight saving time, except in several of the nominally sovereign Native American reservations. A few countries do not observe standard time except as it relates to international travel and communication. For instance, life in SAUDI ARABIA is still governed by traditional Muslim religious rituals that must be held on the basis of observed local solar time, particularly in the sacred cities of Mecca and Medina. The People’s Republic of CHINA uses a single time zone based upon what would be the standard time in BEIJING, resulting in times in the westernmost parts of China being three hours out of step with the environment, but since the bulk of the population lives on the eastern coast, the central government considers the resulting administrative unity more useful.